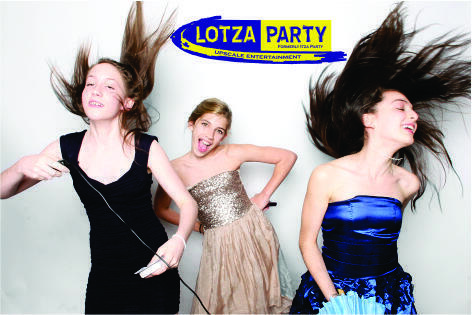 Lotza Party offers photo booth entertainment for all occasions. A Lotza Party cast member will set up the photo booth in a desired location of your special event. We will assist in placing the our booth in a location that works best for each customer. Our photo booth can be sized according to the available space we are given. 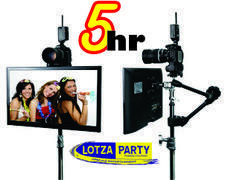 We use a pipe and drape photo booth room that we can customize to each venue.Remember Lotza Party does not us web cams. Our cameras are Canon DSLR providing the best imagery possible. Our booths equipped with 23 inch touch screen displays for an easy user experience. Our start screens are fully customizable for each party. Our graphics department will create the perfect start screen for your party even adding a photo if you like. An Lotza Party Cast member will remain with the kiosk during the entire party to assist your guests. Our price includes everything you need for a great photo booth party including unlimited prints. Delivery charge may apply. Green Screen technology, props, photo size and per photo quantity upgrades available for additional cost. Call us today with any questions on our photo booth kiosk rentals. Our photo booths are custom designed by our cast members at our Turnersville office. All of our photo booths are built with industry leading camera equipment and software to give our customers an easy user experience that spans all age groups. We feature 23 inch touch screen displays with our photo booth kiosks with "live view" so your guests can ready themselves for the next shot. Our photos print out instantly and multiple sizes are available upon request. Don't forget to add props to your photo booth order to take your party to the next level. We carry the Tri-State area's largest prop collection and your guests will truly transform once they start dressing up. Our on site cast member will assist your guests so they have the best photo booth experience possible. If its social media your after then you've come to the right place. Our photo booths feature instant Facebook, Twitter and Instagram connectivity. After each photo guests have the ability to send photos via each of the social media outlets as well a the option of a QR code. A QR code is posted on the screen after each picture your guests take. Guests can then take a picture of this code with their smart phone and their photos are instantly sent to their phone to be shared with all their friends and family. Lotza Party photo booths are the best in the business and offer all the amenity's that you would expect from a top of the line company. Check out our other great options during checkout that you can add to your photo booth rental to make it even more amazing. Features like green screen technology and personalized photo albums or DVD's are just some of the extras that we offer. Wireless internet must be available from the party location for social media features to work. Lotza Party currently rents our photo booths to all of the Central New Jersey, Southern New Jersey, Philadelphia and New Castle Delaware areas. We are based out of Turnersville NJ. If you are unsure of a delivery area please contact us and we will gladly help you. Energetic cast members to set up and remove your party rental equipment.